Find the steps for successful security testing and learn to scan your Windows network for vulnerabilities in this chapter excerpt from "Hacking for Dummies, 3rd Edition." Ethical hacking starts with a plan, so it's important to hone in on the best techniques to make your attack error-free. This excerpt from Hacking for Dummies, 3rd Edition by Kevin Beaver presents the steps to efficient ethical hacking, with details on how you can scan your organization and network for weaknesses. "Before you dive in head first with your ethical hacking, it's critical to have at least a basic methodology to work from. Ethical hacking involves more than just penetrating and patching a system or network. Proven techniques can help guide you along the hacking highway and ensure that you end up at the right destination. Using a methodology that supports your ethical hacking goals separates the professionals from the amateurs and helps ensure that you make the most of your time and effort." 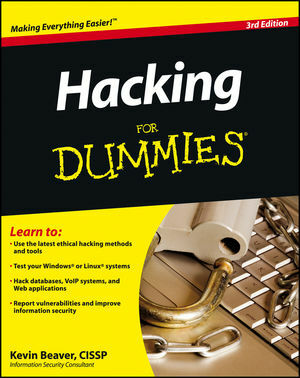 The complete book, Hacking for Dummies, 3rd Edition, is now available for purchase from Wiley Publishing. For more information, check out our podcast with Kevin on how ethical hacking fits into Windows Security tests. This chapter excerpt was posted with permission from Wiley Publishing, Inc..
Kevin Beaver is an information security consultant, keynote speaker, and expert witness with Atlanta-based Principle Logic, LLC where he specializes in performing independent security assessments. Kevin has authored/co-authored eight books on information security. He's also the creator of the Security On Wheels information security audio books and blog providing security learning for IT professionals on the go. Kevin can be reached at his website www.principlelogic.com.